Toro Creek Brewing Company’s saison, amber ale, and oatmeal stout soak up a dose of Central Coast sun. The craft beer, comprised of organically grown hops and barley grown by three North County brothers, is infiltrating taps across Paso Robles, Templeton, Atascadero, and Morro Bay. Not all hops are created equal. This statement was clearly evident as I surveyed the 13 lush, leafy green varieties growing tall at Toro Creek Brewing Company on a balmy August morning. The towering 20-foot high vertical rows overlook a truly impressive view: From where I stood—perched atop hilly Toro Creek Farms terrain located midway between Atascadero and Morro Bay—I could see 6 miles out to the lapping Pacific Ocean. Toro Creek Brewing Company Owner Brendan Cosgrove gave me a scenic, one-woman tour thorough the third-generation family-owned land, also home to colorful orchards and gardens. Donning an understated green ball cap emblazoned with the brand’s “Toro” bull horns and a plaid, snap button shirt, the Cal Poly alum looked all the part of a craft beer aficionado. With virtually nonexistent advertising, the small-batch brewing company is all about maintaining a “less is more” authenticity and “catch me if you can” cool. Alongside fellow partners and brothers Caleb McLaughlin (brewmaster) and Kyle Batoor-Cosgrove (who farms the onsite organic barley and hops), the innovative operation is gaining underground popularity for producing unique, “estate-grown” brews. Toro Creek Brewing Company founder Brendan Cosgrove employed the talents of his brothers Caleb McLaughlin, brewmaster, and Kyle Batoor-Cosgrove, farmer, to create Toro Creek Farms. The operation produces organic hops, bushels of fresh barley, and a range of herbs, veggies, and citrus on the family-owned land. Never heard of Toro Creek Brewing Company? Don’t feel too miffed. The company unveiled its first two beers to the public—an American style amber ale and a Belgium style saison—at last August’s Beaverstock celebration, a down-home music event held at Templeton-based Castoro Cellars. The brothers’ beer will again flow at the 2014 incarnation of the event, slated for Sept. 13 through 14 and featuring bands like Los Lobos, Allen Stone, and Proxima Parada. Yes, I too was surprised to see Los Lobos on this obscure, yet delightful-sounding bill. Since Toro’s summer 2013 debut, the brand has quietly infiltrated taps at Atascadero’s Avion and Claw, Morro Bay’s Libertine Pub, and Paso Robles’ Second Press, among other local hangouts. Be warned: You will definitely be seeing more of the signature Toro Creek bull horns around these here parts. But where did this beer truly emerge from? The origin story of the business is one of entrepreneurial spirit, fertile land, and family ties. About six years ago, Cosgrove was studying business administration at Cal Poly when he created what would become a life-changing senior project: A business plan for a craft brewery. Having like-minded siblings certainly had its perks, and—as it turns out—three heads proved to be infinitely better than one. Eldest brother McLaughlin just so happened to be an award winning brewmaster with ties to Congregation Ale House in Southern California and Rogue Ales of Oregon (the latter even earned him a Great American Beer Festival gold medal). Batoor-Cosgrove contributed an important missing link: A Cal Poly agriculture graduate, he cut his teeth tilling soil at the college’s own organic farm. Now a professional vineyard manager, Batoor-Cosgrove worked tirelessly to research the feasibility of creating the organic hops farm and and barley-growing operation as his own senior project. 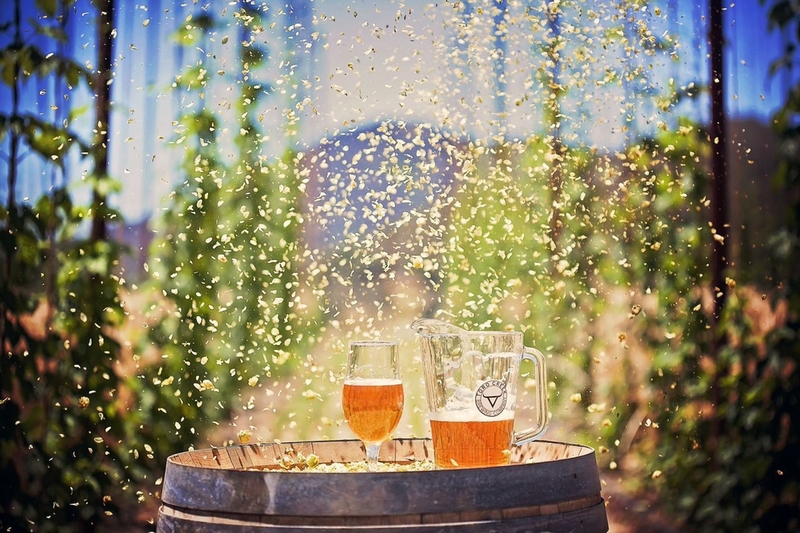 Toro Creek Brewing Company grows 13 varieties of organic hops alongside barley on its hiddenaway farm, located midway between Morro Bay and Atascadero. Together, the brothers have turned the tedious chore of picking the hops by hand into a fun family and friend affair (enter: “picking parties”—somewhat akin to the bottling parties wineries are so fond of). When asked just how the brothers work together, Cosgrove is eager to sing his siblings’ praises. The result has been bountiful, indeed. Aside from organic hops and bushels of barley, Toro Creek Farms produces a mix of seasonal produce and herbs, some of which can be found sprinkled in Avion and Claw’s locally inspired plates. During my recent tour, I spied baskets brimming with copper-hued shallots and trees heavy with zesty citrus. The farm is not open to the public at this time, so you’ll just have to trust me here: It is just as lovely as you are imagining. And when I personally think of Toro Creek Brewing Company, I won’t just imagine that incredible view overlooking Toro Trail. I will forever link the beer to my experience in the farm’s barn/brewery. During my visit, the brothers were in the middle of harvesting barley for their next batch, and the raw, golden stalks emitted an otherworldly, earthy aroma that I’d never experienced in such overwhelming volume. That smell, and perhaps the experience of plucking a few sun-ripened hop buds from those happy green vines are forever solidified in my mind. Toro Creek Brewing Company will pour its amber ale and saison brews as Los Lobos rocks on at the upcoming Beaverstock music festival, slated for Sept 13-14 in Templeton. This, brewheads of the Central Coast, is a truly homegrown take on craft beer. These brothers want you to know: When you take a sip, it’s really their heart and soul you’re tasting. Toro Creek Brewing Company’s estate-grown offerings may be a bit on the “underground” side as of right now, but it won’t take long before everyone and their grandma is clamoring for a locally-sourced swill. Have a pint at Avion & Claw (Atascadero), Libertine Pub (Morro Bay), 15C Wine Bar (Templeton), Second Press (Paso Robles), Thai Bounty (Morro Bay), and Las Stage West BBQ (Atascadero). Oh, and make sure you become a fan of the beer while it’s still hip as can be: Call (805) 550-7007, Facebook “like” torocreekbrewingcompany, click at torocreekbrewingcompany.com or Instagram follow at @torocreekbrewingcompany.